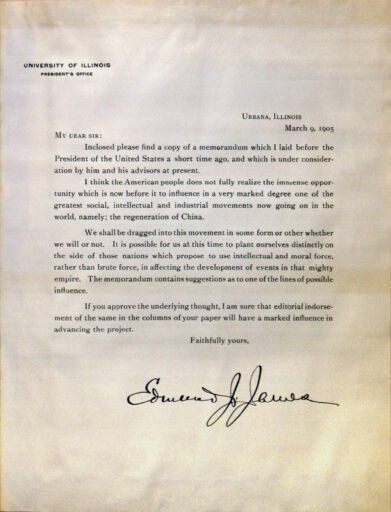 Digital Surrogates from the Edmund J. James Publication Scrapbooks contain digitized correspondence and memoranda, relating to a Memorandum sent by University President Edmund J. James to the President of the United States, concerning the sending of an educational commission to China, in the context of a process known as the Regeneration of China. For more information about President Edmund J. James publications and scrapbooks, see record series 2/5/13. And for additional information about President Edmund James, see Records Relating to Edmund J. James (1904-1920) at Archon catalogue. The Edmund J. James Publication Scrapbooks (Digital Surrogates), 1905 are managed by the University of Illinois Archives and do not feature precise descriptive information for each item. Discover their contents by browsing the folders and files. For more information, contact an archivist at illiarch@illinois.edu.